Sleeping. This section should really be called “you’ll try whatever you can to get sleep” — right? The first few nights home from the hospital I actually couldn’t get in and out of our tall bed with my C-section scar, so I slept on the couch and kept Jane in the Rock’n’Play next to me. Everyone told me this was a lifesaver, and it really did work well when she was tiny. After a few days of using the Rock’n’Play we moved her to the 4Moms Breeze with Bassinet in our room and she slept really well in it. It’s a pricier model but it’s been awesome to travel with and I think it’s worth it, given that it doubled as a bassinet for us. We tried a dozen different swaddles (I still use the Aden and Anais ones for play mats), but our little gal hated having her arms restricted and ended up relying on the Halo brand sleep sack for her up until about 4-months old (now she sleeps without any swaddles or sleep sacks). Using those was a turning point in getting her to sleep well, the sleep sack saved us! Now that she’s transitioned to the crib (the Babyletto Hudson) we use two different baby monitors, a video monitor that we keep downstairs, and an audio monitor that I keep next my bed – I really like them both! We briefly tried one that fed the video to our phones, but much preferred to have the standalone monitors. I also had a few friends suggest a white noise machine for early sleeping assistance, but in this case we preferred to just use the white noise app on our phones to soothe her to sleep and then turn it off so she didn’t get too reliant on it. Eating. I will start this section with the disclaimer that I really didn’t plan to breastfeed Jane, and so I registered for a lot of bottle-feeding things that we didn’t end up using. It worked out that nursing came fairly easy for us, and we had some great nurses and resources at our hospital that helped me come around to it. So for the first few months I mostly only relied on my Boppy for feedings (with a really cute cover from Etsy, of course), and Burt’s Bees burp cloths. I know that some people prefer other nursing pillows, but I liked that this one could be used for her to sit up and play in as we stopped using it for nursing – versatility is key for baby products in my opinion! When we attempted to get her to transition to a bottle it didn’t come easily and we tried 10 different types of bottles. We landed on the Nuk brand bottles that seemed to work well, Latch bottles were a runner up. We’ve use a drying mat for the bottle parts because it’s versatile enough to put grown-up dishes on there too. I do have a baby bottle drying rack, but I’ve only used it for drying my champagne glasses – #MomHack, ha! Now that Jane is jumping into solid foods I’ve been making our own purees each week using our Instant Pot, a blender, and these OXO Tot glass storage containers (and I seriously love them and the little rack they sit in to keep the fridge organized!). We’ve also loved the OXO high chair for her — it’s sturdy and easy to clean, and use the same brand of OXO baby spoons for feedings. Diapering and Bathing. I never thought I’d be writing a whole paragraph on diaper products, but here we are! I’m super brand loyal to Honest for their wipes and won’t use anything else, I think they’re the best! For diapers we’ve had the best luck with Pampers Swaddlers. In Jane’s nursery we went with a changing pad on top of the dresser (with super cute changing pad covers of course) and the Ubbi diaper pail. Both have been great, no complaints! For diaper changes on-the-go I use an adorable diaper clutch that I toss in various tote bags each day, and if we’re heading out for a bigger day trip we pack up our SkipHop diaper bag. My one diapering product I have to recommend – that I didn’t know existed until a friend told me – is one of these bag dispensers for containing a variety of messes when you’re on the go; definitely a must-have! I did lots of research on baby bathtubs and ultimately prioritized storability in the one we decided on. The Boon baby tub is great if you have a small space and need to fold it flat for storage. A friend gifted us some fun tub accessories too, like the SkipHop Whale Rinser and Burt’s Bees washcloths. There are SO many cute hooded towels to choose from, but I can’t say enough good things about how cozy the June and January hooded towels are (and they have the best colors!). On the Go. I wrote a whole post about researching baby gear, and one of my biggest takeaways was trying things out in-person. I landed on the Chicco Bravo Travel System for our car seat and stroller because I liked it so much after “test-driving” it in the store. It’s really compact and the right size for someone shorter like me, plus it has four cup holders so I can really live it up at the coffee-shop. One thing we didn’t buy until right after Jane was born was a second car seat base since we have two cars – it made things much easier! Both of our cars also got their own car seat mirrors so we can keep an eye on Jane (another thing I didn’t know existed until I had a kid!). As a newborn I briefly used the K’Tan wrap as a carrier, but she was never one of those babies that could sleep wrapped against me for long periods of time (I wish!). Now that she’s bigger we have the Baby Bjorn Carrier One and it seems to work well for both me (shorty) and my husband who is much taller. Jane was a winter baby so I was prepared to have her bundled up in all sorts of snowsuits but we ended up mostly putting her in a cozy Gap bear sweater and then tucked her into the car seat with lots of blankets once she was snapped in. Our car seat also came with a zip-on cover to keep her warm. Play Time. I shared a detailed blog post about the best infant toys that we’ve been using for Jane since she’s been in the playing-stage. A few stand out items that I’d recommend registering for were a wooden play gym that she has enjoyed since she was tiny (I love that it breaks down into a small box for storage!) and the Baby Bjorn bouncer seat with a toy bar that I use daily for her to sit in while I take a shower or prep dinner. She has a few favorite smaller toys too like a wooden bead grasping toy, Sophie the Giraffe, and the Organic Farm Buddies rattles. She is entertained endlessly by one activity toy that hooks on to the stroller or car seat – the bunny is her favorite. I registered for tons of classic board books too, with favorites from own childhood like Madeline and The Very Hungry Caterpillar. I also found some really beautiful newer books that I hope she enjoys when she gets a little bit older like Julia, Child and Henry’s Bright Idea. One book that I find hilarious for both babies and adults is Foodie Babies Wear Bibs. She also loves the dinosaur pictures in No, No Dinos! Clothing. I didn’t register for a ton of clothing, but have found a few favorite pieces since Jane was born that I’d recommend for new babies. Gap pajamas are my favorite because they zip up easily and wash well. I also have a few tops with built-in onesies from the Gap that were early favorites. June and January make a great cross-body newborn onesie that was so cozy, came in the best colors, and were very easy to get on a squirmy newborn. 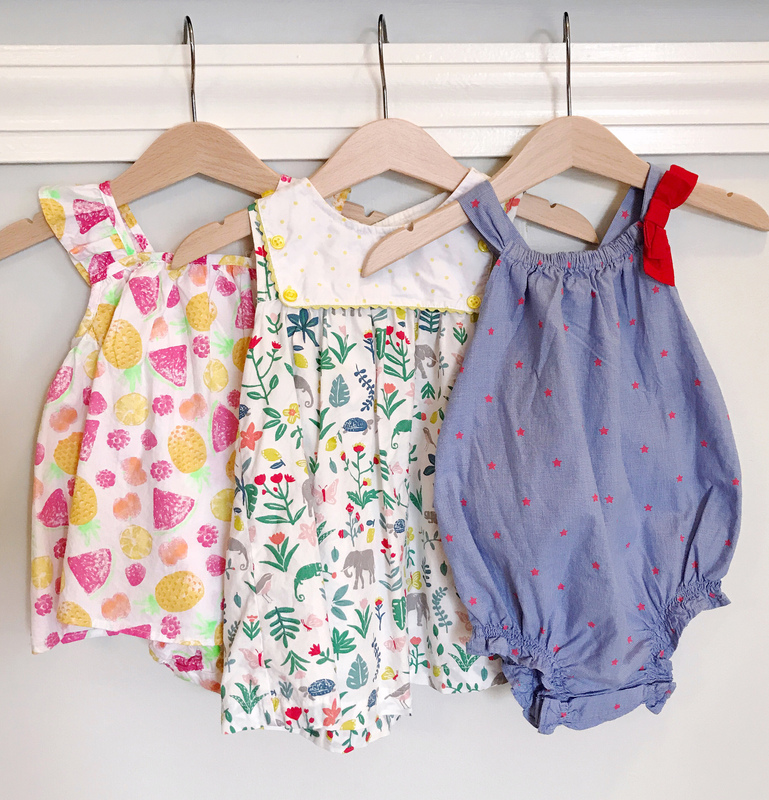 Hanna Anderson has amazing pajamas and they last forever (we’ve gotten hand-me-downs that have been through at least two kids prior to Jane) – they make some really cozy dresses too! For dressier options I think Boden has the best kids clothes – I’m smitten with the dresses and play sets. Jane wears Freshly Picked moccasins almost every day, they’re the one type of baby shoe that actually stays on her feet. We also used plain white onesies all the time when she was a newborn and they’re perfect to mix in with other pieces. Random Stuff. There were a few random things I didn’t realize we needed until right after Jane was born – one of them was night-lights! Register for a big pack of these and you’ll thank me later. My friend Alison also told me one of her best pre-baby gifts was a 10ft cord for the phone charger to bring to the hospital and to have for easy charging when nursing – so smart. We also registered for a few fun items for our nursery like a nice hamper and pretty canvas totes to store diapers and toys in. Jane was a winter-baby so I didn’t think to register for a lot of summery items, but now that it’s warm out we have a selection of cute hats and some Babiator sunglasses for her to protect her from the sun (these sunglasses actually stay on her face and have a lifetime guarantee!). And that my friends, is my ultimate baby registry list! Any must-haves you’d add on from your own experiences? Send this along to your pregnant friends and share your thoughts with me, I’m all ears! 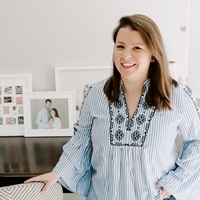 One Response to "The Ultimate Baby Registry Review – Six Months Later." i always wanted the baby bjorn bouncy seat — good to know it’s worth the price tag! we have the hudson crib too and i love it versatile it is. we’ve used it with both boys so far! awesome list!